NOTE: Most park restroom facilities are open to the public from April 15 to October 15, from 8 am to 9 pm. The restrooms at Abshire Cabin and at the warming house in Shanklin Park, however, remain open year-round. Shanklin Park pond restrooms (Plymouth Avenue/Millrace Trail) and Abshire Cabin restrooms (East Lincoln Avenue/Pumpkinvine Nature Trail) remain open year round. Fidler Pond Park (Lincolnway E.) has a port-a-let year round at the red barn. Pumpkinvine Nature Trail has a port-a-let at C.R. 28 year round. Wilden Avenue Trail at N. 1st Street & W.Oakridge Avenue will have a port-a-let throughout the winter months. Area: 75.5 Acres. Donated to the Parks and Recreation Department in 1986, this is the second largest park in the City. Developed to accommodate primarily passive and interpretive programs, Abshire Park helps to maintain balance in the park system between active and passive recreational opportunities. The park lies adjacent to, and is accessible from the Pumpkinvine Trail, a leg of the Maple City Greenway Trail Network. The north end of the park is a managed natural area and includes a prairie restoration, wet lands, and traditional forest. Rock Run Creek borders the park to the southwest and provides an excellent habitat. Abshire Cabin, a rentable enclosed pavilion, is located at this park. Area: 11.08 Acres. 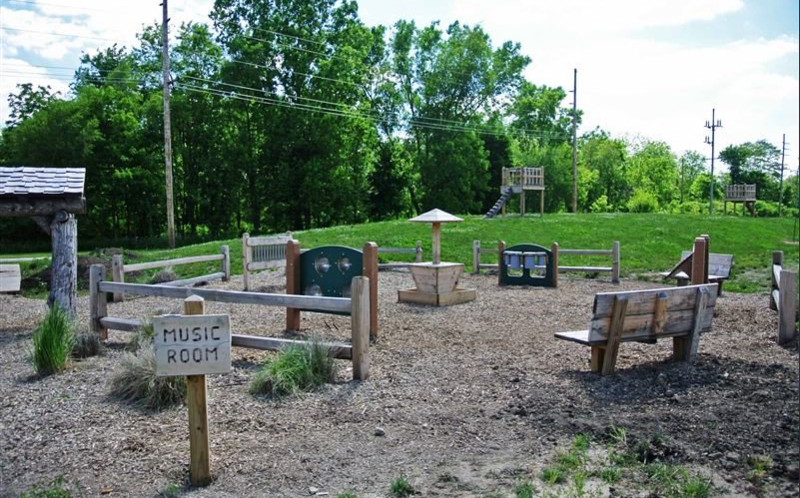 This park's features include a children's interactive art and music play area, hill slide, lookout towers, climbing wall, open play spaces, and trails. It also has community gardens. Allan J. Kauffman Park was the recipient of the Indiana Park & Recreation Association's award for Exceptional Park Design in 2015. Area: 0.5 Acre. Park features include a playing field, playground and picnic area. It is an example of a “vestpocket” park. Area: 0.5 Acre. This park is another excellent example of a neighborhood “vest-pocket” park. Facilities include a basketball court, a play structure and an open field. Mature shade trees in and around the park enhance the park's image and usability in hot weather. Area: 34.5 Acres. The classified forest was acquired in 2003 and is 34.5 acres. Dr. Larry Beachy, the original owner of the classified forest, planted many of the 23 tree species located in the forest. The classified forest offers interpretive trails, wildflower viewing and enjoyment of nature. The Rieth Interpretive Center, located in Millrace Park to the north of Classified Forest, schedules bird viewing and nature walks through the forest. Area: 1.7 Acres. This park is primarily used for informal open field play. However, developed features at the north end of the park include a lighted basketball court, a playground, and a shuffleboard court. Area: 100 Acres. This park has an 80 acre pond with canoe, kayak and pedal boat rentals; fishing pole rentals; catch and release bank fishing; swinging benches to relax in and enjoy nature; and a popular walking trail around the pond. It is also the location for Chiddister Pavilion, a rentable open-air pavilion; the Wayne Wogoman Welcome Center; and the Lincoln Highway Gazebo. Fidler Pond Park is the venue for events such as Goshen's annual Rock the Quarry Triathlon, nature talks and campfire sing-alongs. 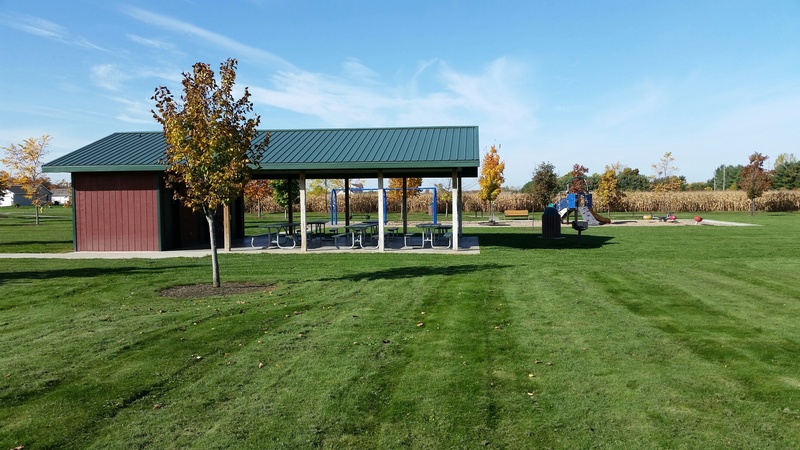 Fidler Pond Park was the recipient of Indiana Park & Recreation Association's Park Development Award in 2013. Area: 0.1 Acre. Five Points Park is a city green space. A site plan will be developed to make this into a city focal point. Area: 5.0 Acres. Located in the Clover Trails subdivision, this 5 acre park was donated and developed by Mr. Steve Hay, previous owner of the land. This park has a playground, community gardens, walking trails, and Hay Pavilion. Area: 0.5 Acres. Located on South Main Street, this park is a city green space. A site plan will be developed to make this into a city focal point. Area: 7.0 acres. Comprised almost entirely of open water, this seven-acre park is appropriately named because of its location directly south of Linway Shopping Center. The property extends to the west bank of the Elkhart River and serves as a stormwater detection area for Linway Plaza Shopping Center. Area: 0.2 Acres. Located on Vinson Court, this “vest pocket park” is less than a half acre. It was created by a partnership with Habitat for Humanity and Mrs. Dorothy McFarland who donated the playground equipment, picnic table and benches. Area: 17.0 Acres. This park is home to the Rieth Interpretive Center, which has a bird-viewing area and other nature and environmental exhibits. It is also the location for special events such as the Maple City Arbor Day Celebration. Millrace Park lies between the Elkhart River and Millrace Canal, on Plymouth Avenue across the street from Shanklin Park. The Millrace Trail skirts the east side of the park, providing excellent bicycle and pedestrian access. The western and southern portions of the park are particularly picturesque, largely due to the impact of the Elkhart River and its floodplain. Area: 4.0 Acres. Model School Park is an “L” shaped tract of land adjacent to Model Elementary School. Features include outdoor pickleball courts and an open play field. Area: 15.0 Acres. 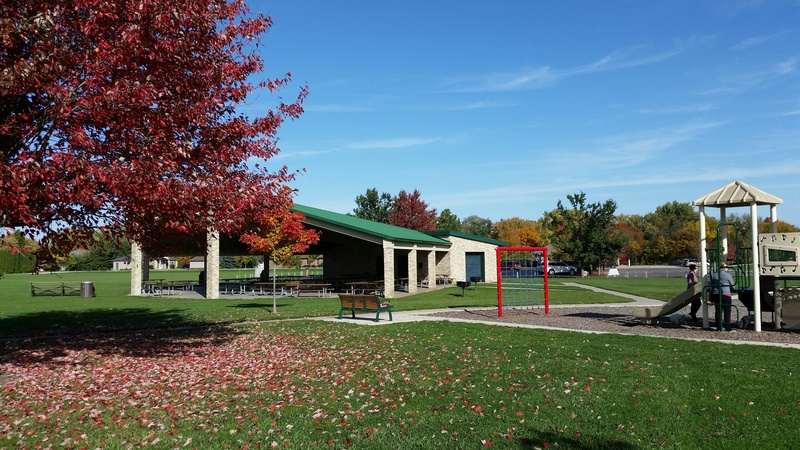 Nearly 15 acres in size, Mullet Park is located between Indiana Avenue and the Elkhart River, and is accessible via a pedestrian bridge which crosses the river into Shanklin Park. The park is essentially open space except for several trees and a trail leading to the pedestrian bridge. Area : 3.5 Acres. This park is the largest of the neighborhood parks. It lies just north of Oakridge Cemetery, at the corner of N. 1st Street and Oakridge Avenue, and is bounded on the south side by Rock Run Creek. Features include a lighted basketball court, and Oakridge Pavilion.The Historic Iron Truss Footbridge that crosses Rock Run Creek into Oakridge Park was relocated from Wilden Avenue in 2003. Area: 14.0 Acres. Originally donated in 1979, this primarily sports-oriented park serves an important community need. The park can be accessed from Lincoln Avenue or Greene Road, via entrance drive north of Model Elementary School. Features include youth soccer fields, sand lots for volleyball, a playground, a perimeter pedestrian path, and Fidler Pavilion, a large rentable open-air pavilion with a kitchen facility. Fidler Pavilion accommodates free concerts in the summer and is the venue for several Park sports programs. Area: 1.3 Acres. Built on land donated by the Rieth Family in 1980, this neighborhood park features a basketball court, a small picnic shelter, an open play area, and a playground with a playset that has an adaptive seat and a wheelchair swing. This park is zoned very clearly between structured and informal uses. Land and Water Conservation Funds were used to develop the park. Area: 12 Acres. Originally developed in 1909, Rogers Park was the largest and most heavily used park in the City for 50 years. Facilities include a large historic picnic pavilion, a lighted basketball court, a lighted baseball diamond, restrooms, a canoe launch and a playground. A pedestrian bridge spanning the Elkhart River connects the park to the downtown area and the Maple City Greenway. 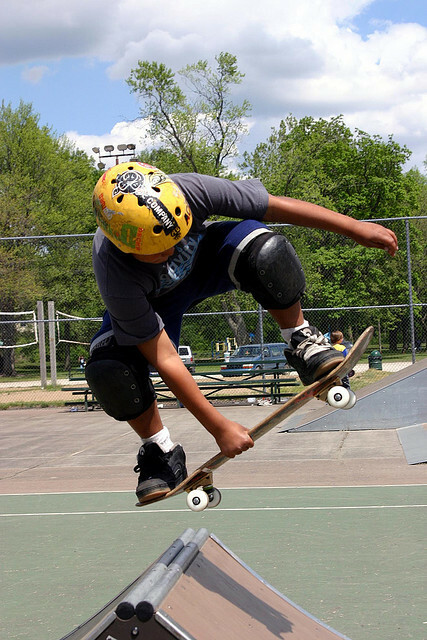 It is also the site for Tyler S. Joldersma Memorial Skate Park, a community-built facility for skate boarders and inline skaters to practice their sport. Area: 90 Acres. Shanklin is by far the City’s largest park, and it lies between the Elkhart River and Millrace Canal at the heart of the community. Since its development in 1958, Shanklin Park has become the “hub” of recreational activity in Goshen. 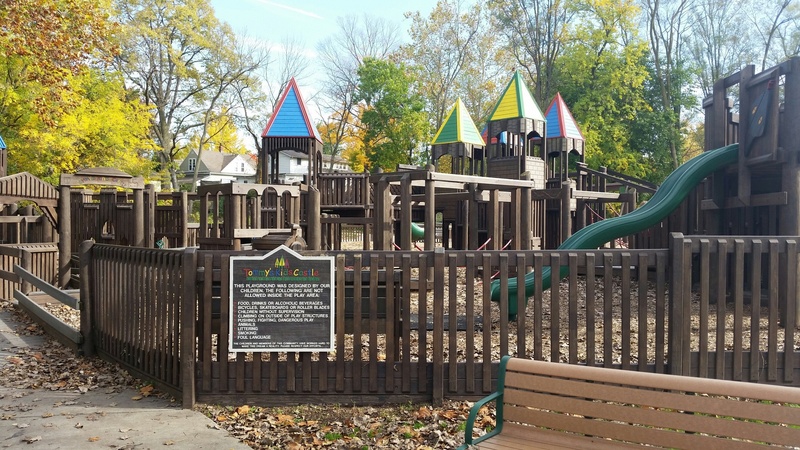 Facilities include lighted baseball/softball diamonds, a canoe launch for the Elkhart River, community-built Tommy's Kids Castle, Kiwanis Pavilion and a playground. It is also the location of both Shanklin Pool and Schrock Pavilion, a large rentable enclosed pavilion where many Park special events and programs are held. Shanklin Park also boasts significant passive opportunities, including native grasses and wildflowers, a long forested wetland and a perennial garden that delights passers-by. Area 17.0 Acres. Designed as a natural education area, Shoup-Parsons Woods was dedicated in 1980. The park is comprised of nearly 17 acres of lowland forest between the Elkhart River and the Millrace Canal and is accessed by crossing the headgates of the Millrace at the Goshen Dam Pond. Features include a paved fully accessible trail loop, a boardwalk overlooking an existing wetland and additional interpretive trails. Walnut Park Splash Pad, on Goshen’s north side at East Oakridge Avenue between 5th and 6th streets, and Rieth Park Splash Pad, on Goshen’s south side on 13th Street between Iowa and Illinois streets, function daily from May 25 to August 30 from 12:00pm to 8:00pm (weather permitting). Area: 1.8 Acres. 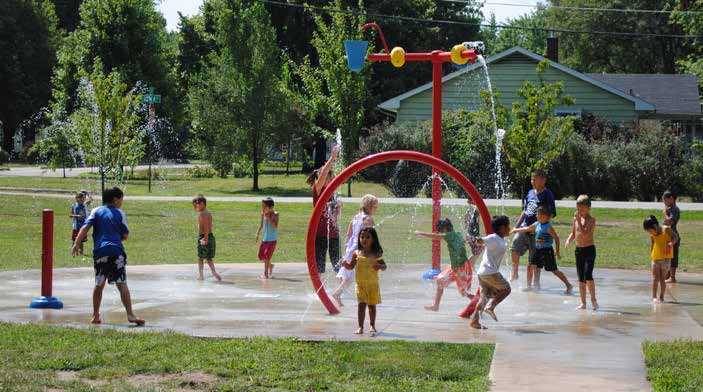 A neighborhood park of less than 2 acres, Walnut Park includes a softball field, a basketball court, a playground, splash pad and a picnic shelter. The “L” shape of the site helps to create activity zones for basketball, softball and playground use. Slight “topography” in some areas of the park adds interest and sledding opportunities. Area: 3.4 Acres. This area formerly was the City Water Department property. This park was deeded over to the care of the park Department in 1997. Its primary use is to provide green space and an open play area. Area: 27.95 Acres. Located on the southeast side of the City. Waterford has 27.95 acres of undeveloped area. A park improvement plan will need to be put together.